Baltimore is known for its historic neighborhoods, monuments, crab cakes — and, increasingly, its bed bugs. For the second straight year, the U.S. port city ranked No. 1 on a Top 50 Bed Bug Cities list compiled by Atlanta-based pest control services company Orkin LLC. The list, released Monday, is based on the most residential and commercial treatments for the seed-sized bloodsuckers from December 2016 to November 2017, and reflects a rising number of infestations across the U.S., according to Tim Husen, an Orkin entomologist. 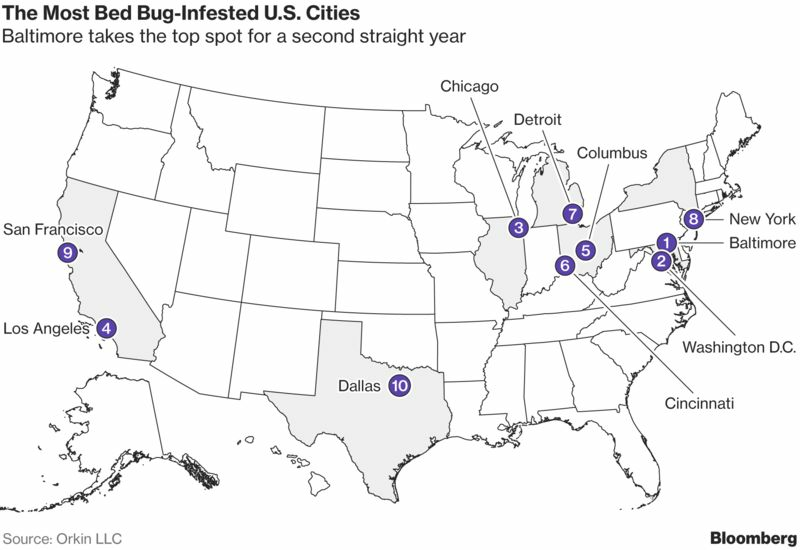 Washington, 40 miles from Baltimore, was ranked second on Orkin’s list, followed by Chicago, Los Angeles and Columbus, Ohio. 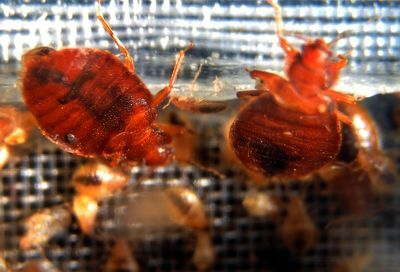 The Baltimore City Health Department doesn’t have any bed bug mitigation programs, according to its website, which gives tips on identifying and controlling the ancient critters. Since Orkin began reporting the top bed bug cities, complaints to a 311 municipal services number in Baltimore for bedbugs have gone down by more than 30 percent, said Tania Baker, director of communications for the city’s housing authority. Bed bugs have been a nocturnal pest for at least four millennia. Although numbers were dramatically reduced after World War II, the parasites have made a comeback thanks to increased global travel, regulatory restrictions on insecticides like DDT, and tolerance to newer, organic bed bug treatments, according to researchers at the Eleanor Mann School of Nursing at the University of Arkansas in Fayetteville. That’s stoking a national bed bug control industry that Specialty Consultants LLC, a research firm based in Jacksonville, Florida, said in April was worth $611.2 million in 2016. Gary Curl, the consultancy’s founder and president, predicted a year ago that if trends continue, industry revenue could hit $1 billion in five years. Orkin, owned by Rollins Inc., partnered with market research firm the Bantam Group to survey 100 U.S. hotels in 2016 to gauge the cost of bed bugs to the hospitality industry. Among key findings, released last August, four out of five hotels surveyed had treated for bed bugs in the past year with the most recent bed bug incidents costing an average of $6,383 in lost room revenue, disposal of soft goods and pest control treatment. Almost half of hotels had been the subject of litigation because of bed bugs, with legal costs averaging $17,177 per incident. Infestations are worsening in many countries, except in Australia, said Doggett, who is the chief editor of the forthcoming book Advances in the Biology and Management of Modern Bed Bugs, the first major scholarly work on the subject in 50 years, slated for publication in March. “Numbers seem to be decreasing, but we are the only continent in the world where bed bugs seem to be going backwards,” he said. Terminix, a pest control company owned by ServiceMaster Global Holdings Inc., released in August a list of the top 20 bed bug-infested cities in America, based on service requests the firm received during the first half of 2017. Its Top 20 Bed Bug Citieslist ranked Cleveland, Cincinnati, Detroit, Las Vegas, and Denver in the top five.